A Girl loves teriyaki sauce. Teriyaki is easy to make with a few ingredients-soy sauce, mirin & sugar. Why buy it in a bottle? A Girl decided to do a twist on teriyaki. In a saucepan combine nama shoyu, mirin, garlic, ginger & cilantro over medium high heat. Once it boils, turn the heat down, and let it simmer for about 3 minutes. Remove sauce from heat and let it cool down. A Girl recommends making this beforehand. Once the sauce is cool, use it as a marinade for the chicken. Marinate the chicken with the teriyaki sauce for 30 minutes, 1 hour or up to overnight. Make sure to leave some extra teriyaki sauce to drizzle over grilled chicken before serving. Heat your grill or cast iron grill pan. Grill chicken for about 3-4 minutes per side. Adjust grill time according to thickness of chicken breast. The best method to check is cut into it, making sure the juices are clean. Remove from grill. Plate it. 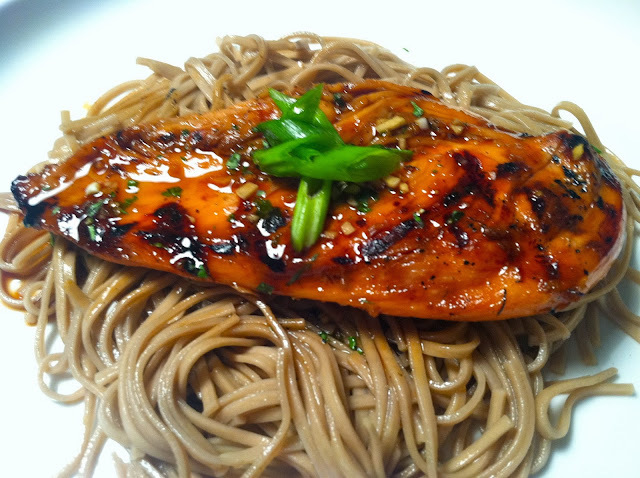 Drizzle the grilled chicken with extra teriyaki sauce and garnish with scallions. A Girl served the grilled chicken over cold 100% buckwheat soba noodles and a side of bok choy with garlic & ginger.